“Do you want to go any closer?” said Muninn, perched upon the rail next to his hands and in the shape of birthday cake and diversion. “I’m… I’m not sure,” said August. The clouds looked so dark and angry and he could feel the volcano grumbling in his bones, vibrating all through him. The deck shook with it, shook under his bottom and his legs where he sat clutching at the rails. “Then I think I’d rather stay here,” said August, shuddering. He was falling apart already and knew it, but he wasn’t so enamoured of the process that he was willing to lose anything else, even at the last. “Very well,” said Muninn, serene. “What was it like?” said August, tentative. He couldn’t imagine the memories would be pleasant, couldn’t imagine dying like the people at Pompeii had died, choking and burning both and beyond all help either way. “You could see it coming,” said August, and it was not a question. “Did the people try to get away?” said August. August was silent. He had seen, often, in the front of the phone book and in emergency kits that if a tsunami was coming you shouldn’t go to the beach to see it, that the water would be too fast to outrun. He tried to picture it, to imagine a great dark wall rising before him and all he could hear was roaring, the roar of the volcano and the rumble of it and it drowned out the noise of the water in his head. He closed his eyes, because he was tired and trying to concentrate, to picture inside himself the giant waves that Muninn had told him about. He saw one then, within his mind–sitting in front of a silent wave that towered over him, and although the wave was water it was also mirrors, black mirrors, and that was not water. A real tsunami, he expected, would be turbulent, full of movement and rough to the surface, but August’s tsunami was made of glass and hung over him in frozen stillness, almost as a photograph, and in its smooth slipperiness he saw his own face, reflected in a thousand black glass facets and drowning him in shadow. “Sometimes running is hopeless,” he said. “Were you surprised to see how many didn’t?” said August. “It wouldn’t make a difference, crawling,” said August. “Then why are you doing it?” said Muninn, and when August turned away, screwing his eyes shut so that tears wouldn’t escape, he was back in his own mind again, back in front of the black mirrors, mirrors in the shape of still water and which smelled of sulphur, of seared rock and burning. And he could feel the deck of the boat under him still, feel it pressed hard against his hips, against the backs of his legs–but the August reflected in front of him, the August in the wave had no boat to sit upon. He wasn’t sitting at all, even, but crawling–crawling towards the August that was, crawling as the wave loomed over him and the volcano roared so that he could hear nothing else. And then August saw something else reflected in the wave: a tiny light, flickering beside his knees, and it was a candle, a birthday candle, and August knew then that his reflection wasn’t crawling towards him but to the candle, dragging his hurt and aching body forward before the water came down to smother him and douse the candle out. When he opened his eyes again the candle was on the deck next to him–and then it wasn’t a candle but a piece of burning ash, come down from the sky in dust and smoke and tiny pieces of black grit that greyed his skin and settled on Muninn’s iron feathers like frosting. 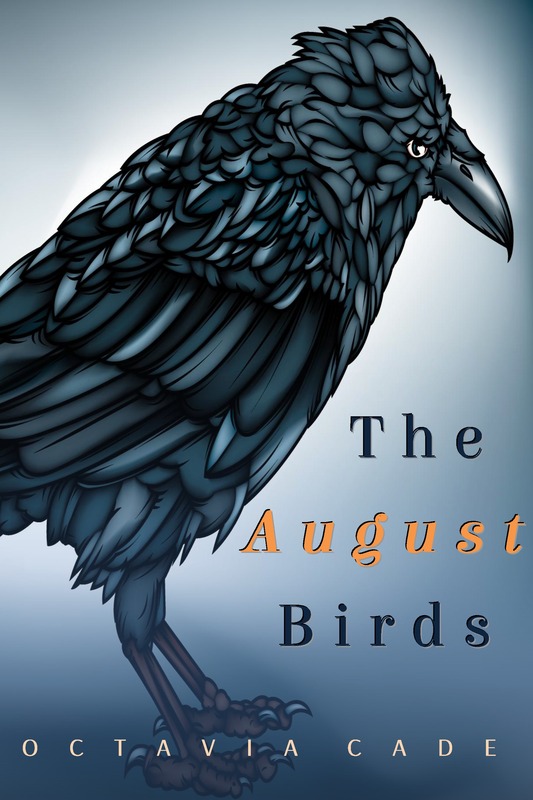 “Are you going to blow it out?” said the bird, and August stared at her, stared at the little light, and shook his head. She spoke as if to herself, but beside her August shivered. He was tired of in-betweens, and as tired of certainty. It would be a relief, almost, not to have to choose anymore, not to have to hold the candle and the water in his head at the same time, not to run towards and away at once. He cupped his hand about the little flame, as if about to smother and shelter both, and waited for the final explosion, the final wave. Tune in tomorrow for the next chapter, wherein August is taken back in time to see Sealab II!